It was our first time back in the states after three and a half years in Lima, Peru. My mother-in-law kindly (and excitedly) asked us, "What things do you want to do? Where do you want to go to eat?" Our answer? We want to go on picnics! Lima, Peru where we were missionaries is in the middle of a coastal desert on the western side of South America. It doesn't rain there. Everything is brown. Everything is dusty. And what few parks there are mostly weren't places you want to have lunch and let your toddler run around. So we were honestly craving green and outdoor eating. Today we live back in the states and have a wonderful backyard and several nice parks nearby and I'd still rather go on a picnic than to a restaurant. You might think a picnic is more work. But think about it. If you have to work at your job for 1-3 hours to pay for a dinner for two at a medium priced restaurant, you've worked pretty hard. 3. I'm in the fresh air--Fresh air and sunshine is good for you, right? Not just your lungs and your vitamin D, but it's just good for you mentally to get out of doors and enjoy nature. I'm pretty sure that's why God created it so beautiful. 6. I'm actually able to have a conversation--Restaurants are crowded and noisy and so many of them have TVs going now that it's hard to carry on a conversation--especially when you have hard of hearing people in the family, a demographic I'm becoming part of too quickly! 9. I'm relaxing more than in a noisy restaurant--The noise, the activity, the constant questions about if everything is fine (or the stress of trying to get your server's attention), is just not relaxing. Sitting with a sandwich or a simple casserole of mac'n'cheese and iced tea, is much calmer. Make it a goal this summer to eat out once a week...outside, I mean! And here are some picnic ideas for kids and adults. I love this! Being outside is one of my favorite things. I need more picnics in my life. 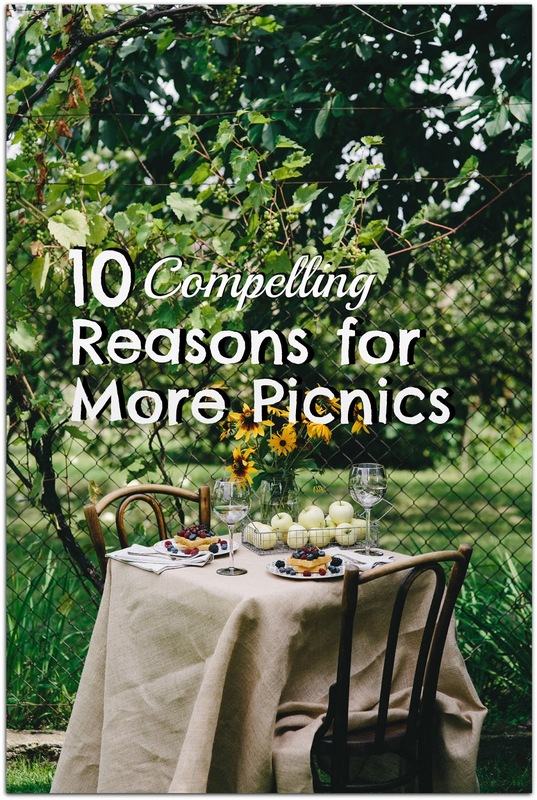 Even as I wrote it, I made a resolution to have more picnics this summer! I love this! We live in La so summers are extremely hot and humid, but fall and spring is perfect for a picnic. I'm definitely going to be scheduling a family picnic soon! Thanks for the inspiration and for linking up at Salt & Light. Yes, where you live will affect when you can eat outside! Thanks for hosting the link-up! Good for you! We've had a few meals outside, but then it got cold and rainy again. Summer will come! Hope your front lawn grows back quickly! Anywhere outside is a great place for a picnic!